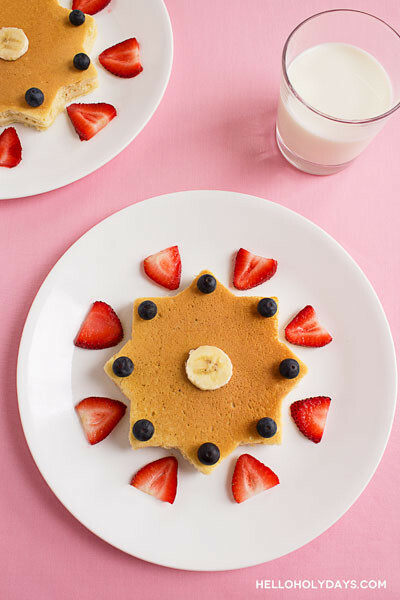 8 Pointed Star Pancakes – Hello Holy Days! Use our large 8 pointed star cookie cutter to make delightful pancakes for Ramadan. Make them for your pre-fasting meal or for kids on the weekend. 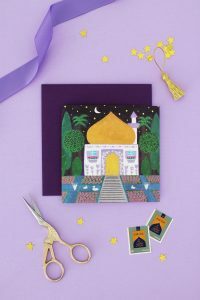 They’re a great way to add some cheer to your Ramadan celebrations. Place the cookie cutter on a large non-stick frying pan and spray both the pan and the cutter with non-stick cooking spray. Pour 1/2 cup of prepared pancake batter into the cutter. Using the back of a spoon, make round circles in the center of the star to get the batter to spread evenly throughout the cutter. For a perfect shape and golden colour every time, cook on medium low heat. When bubbles begin to appear in the batter, use a large spatula to turn over. Once both sides are cooked, remove from heat and plate. Let cool a few minutes and then carefully loosen edges of cookie cutter and remove. Garnish with fruit and syrup if desired.